MFASCO Health & Safety offers special opportunities to groups and organization. 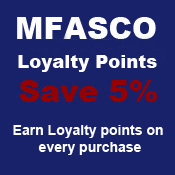 Depending on who you are, special prices, terms or other unique offers are extended providing additional incentives to become a loyal MFASCO Health & Safety customer. Please contact Customer Service and let them know about your group or organization so we can discuss you begin to save. Please call 800-221-9222 Monday - Friday between 8:00 AM and 4:00 PM Eastern Standard Time.